References to Classical antiquity can be found everywhere. In fact, our modern world is built around its concepts and ideas, its language, architectural and stylistic elements as well as its stories, myths and characters. Classical antiquity has had such a huge impact on every single following century, that many of the above-mentioned elements have become a natural part of our daily lives – so natural, I believe, that most people probably do not even know they are passing on knowledge of or stories about events that took place so long time ago. However, some people are fully aware of the connections between past and present and use this awareness deliberately in creating something new. But why is it that specific people choose to mix certain eras to portray individual characters or events? The answer is that these fusions of different time periods cannot only tell us something about the past; they can also tell us a great deal about the present. In films for example, comments on current and possibly sensitive topics, can be easier and more freely delivered when shown through the veil of centuries past. In this article I would like to show you what at first glance might seem a rather odd example when talking about the use of Classical antiquity in film – namely Monty Python and the Holy Grail (hereafter MPHG). Those who have watched MPHG will easily recall a plot revolving around the legendary, and Medieval, king Arthur and his knights of the round table – a not particularly ancient Greek or Roman tale. But as the following analysis will show, these two worlds have a lot more in common than initially perceived. For those unfamiliar with Monty Python, let me first provide you with this short presentation. The satirical group Monty Python consisted of six British/American comedians, all of whom had an academic background in various fields. In 1971 their first film And Now for Something Completely Different was released, a sketch-based film aiming at an audience among American university students. 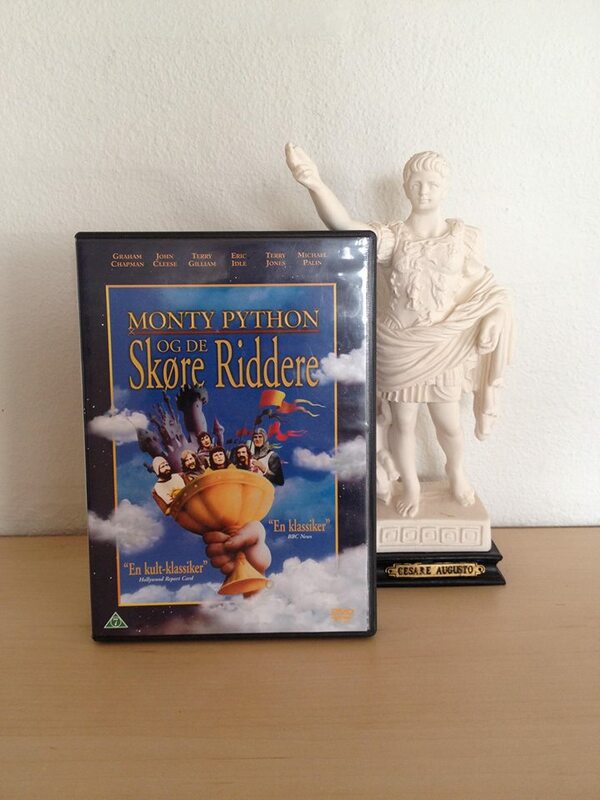 Through this it becomes evident what kind of audience Monty Python wanted and were able to engage with. The group’s roots in an academic environment must have contributed to their insights into Classical antiquity and canonical texts such as The Iliad and The Odyssey, a knowledge they managed to transform into a new and funny context in their following films and tv-shows. The group possessed an extensive knowledge of history and mythology, which was not limited to British history. This is reflected in several of their works where: “they incorporated figures from numerous mythologies and legends.” This knowledge probably resulted in the clash between Classical antiquity and The Middle Ages seen in MPHG. Even though these two time periods seem far apart and very different, detecting several similarities between the worlds of Odysseus, king of Ithaka, and Arthur, king of the Britons becomes fairly easy, as will be apparent in the following sections. different people. Minna Skafte Jensen has argued, that the poems were written down in the form we know them today in Athens during the reign of Peisistratos. This means that an editor at this time, approximately two hundred years after the poems were created, took an active choice in selecting which versions of the various songs should be put together, possibly leaving out, for us, unknown tales. 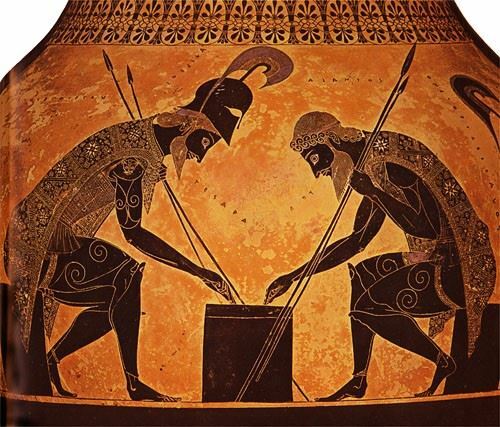 This becomes apparent when looking at ancient Greek pottery, where a specific scene showing Achilleus and Aias playing a board game is repeated over and over. We do not know this scene from any written version of The Iliad, but given the number of representations on Greek vases, the scene must have been a recognizable part of the Trojan cycle of legends. Heroes like Achilleus, Agamemnon and Odysseus were legendary figures long before the poet of The Iliad and The Odyssey created these works, and therefore the ancient characters have come to mean a great deal for many different peoples, their history and their identity. People acquainted with classical myths and texts will probably have heard of the Roman poet Vergil and his most famous work The Aeneid, whose twelve-song structure and themes is composed of a mix of that of The Iliad and The Odyssey. The Aeneid is a continuation of The Iliad just like The Odyssey, the difference being that The Aeneid was created as a written work from the beginning by a Roman poet in the first century A.D. The Aeneid portrays the escape of the hero Aeneas from the burning ruins of Troy, his journey to Carthage where he meets and falls in love with the queen Dido and the gods’ intervention to keep him on track for a higher purpose; the founding of Rome. So why is this important? It is important because the Trojan cycle of legends in this way becomes a part of Roman history, and even more importantly, of later British history. In a text called Historia Brittonum (ca. 828 A.D.) Arthur is mentioned for the first time: “Then it was, that the magnanimous Arthur, with all the kings and military force of Britain, fought against the Saxons. And though there were many more noble than himself, yet he was twelve times chosen their commander, and was as often conqueror.” According to this, Arthur was a British military commander who fought the Saxons. This means that Arthur originally was not a king, yet chosen as a leader twelve times to fight the same number of battles. The key here is the number twelve. If we take a closer look at how many challenges Odysseus faces during his struggle to reach Ithaka, the number is also twelve: Calypso, Circe, the Cicones, the Lotus-Eaters, the Cyclops, Aeolia, the Laestrygonians, the Underworld, the Sirens, Scylla and Charybdis, Helios’ sacred cattle and the Phaeacians. The tale of these adventures ends in the twelfth song, giving the twelve remaining songs a very different expression. In this way Odysseus’ tale might as well have been divided into two different stories of twelve songs each. The number twelve also calls to mind the twelve labors of Heracles besides the fact that Odysseus must fire an arrow through twelve axe shafts to win back Penelope. Historia Brittonum is interesting in many ways, first of all because we do not know who wrote it, although some editions are followed by a prologue by a man called Nennius. This prologue also mentions that Historia Brittonum has been compiled of earlier sources and orally transferred myths, which leaves us facing similar problems with this text as when talking about The Iliad and The Odyssey and the Homeric questions. Furthermore, Historia Brittonum is interesting, because it served as the inspiration for Historia Regum Britanniae (The History of the British Kings, ca. 1100-1155A.D.) by Geoffrey of Monmouth, and Historia Regum Britanniae mentions Arthur in a list of British kings going all the way back to Troy. But not only Historia Regum Britanniae is explicit in its postulates concerning the link between the lineage of Aeneas and the Britons. The 10th paragraph of Historia Brittonum reads as follows: “…the Britons deduce their origin both from the Greeks and Romans. On the side of the mother, from Lavinia […] and of the race of Silvanus, the son of Inachus, the son of Dardanus; who was the son of Saturn, king of the Greeks, and who, having possessed himself of a part of Asia, built the city of Troy. Dardanus was the father of Troius, who was the father of Priam and Anchises; Anchises was the father of Aeneas, who was the father of Ascanius and Silvius; and this Silvius was the son of Aeneas and Lavinia, the daughter of the king of Italy.” A note informs us that this particular paragraph is missing in some editions, but §10 as well as §11 tells us about a man called Brutus, who interchangeably is described as being the grandson and the son of Aeneas. No matter what, Historia Brittonum claims that this Brutus was a descendant of Aeneas, the most important point being that Brutus would come to populate Britain and rule over the Britons. Due to the similarities between the characters of Odysseus and Arthur – both clever kings with excellent fighting skills on a mission, besides Aeneas’ flight from Troy and his descendants’ role in the population of Britain, a mythic coherence between the Greek-Roman heroes, the Trojan cycle of legends and the later British heroes is established. Thus, Troy becomes the starting point for the events portrayed in The Odyssey as well as the Arthurian legends; stories that have both arisen through orally transferred stories about heroes whose existence we have no historical evidence for. The similarities do not make Arthur a historic king or character, nor do they make him Odysseus per se, but the link between these two myths tells us something about what kind of heroes the Britons historically have wished to be identified with. In this way MPHG shows the migration through time and space and the assimilation to the new cultural context the archetype Odysseus and the Trojan cycle of legends have taken through their journey from Classical antiquity to the Middle Ages. Turning to the film itself, similarities relating to structure can also be detected. Just like The Odyssey, MPHG is divided into two parts: as for MPHG the recruitment of the knights and the search for the grail, as for The Odyssey the journey of Odysseus followed by him regaining his status on Ithaka. Moreover, both stories contain a storyline running parallel with the main story. The Odyssey follows Telemachos and his search for his father, simultaneously with Odysseus trying to find his way home. In MPHG, the other storyline consists of a “famous historian” informing us, the audience, about the legend of king Arthur. This historian is, however, killed by a mounted knight in an anachronistic scene, proceeded by the modern police arriving at the crime scene. This can be interpreted in two ways: the investigation by the police results in them following in the footsteps of the knights, just like Telemachos follows in the footsteps of his father. Both Telemachos and Odysseus on the one side and the police and Arthur on the other side meet in the end, but where Odysseus ends up a victor, Arthur reluctantly abandons his mission as he is arrested by the police. This happens to the accompaniment of howling sirens – a possible image of Odysseus/Arthur giving in to the Sirens after all. A different interpretation is that the murder of the guardian of “wie es eigentlich gewesen” enables Monty Python to use history and historical events as they like, thereby getting the opportunity of altering our horizon of expectations. Mainly scenes taken from the so called “adventures of Odysseus” are recognizable in the film. The adventures of Odysseus are among the most commonly known parts of the ancient epic, and even reviews from the time of the film’s premiere support this fact: “The gags are nonstop, occasionally inspired and should not be divulged, though it’s not giving away too much to say that I particularly liked a sequence in which the knights, to gain access to an enemy castle, come up with the idea of building a Trojan rabbit.” This exact scene copies the probably most iconic of Odysseus’ tricks – namely that of the Trojan horse. 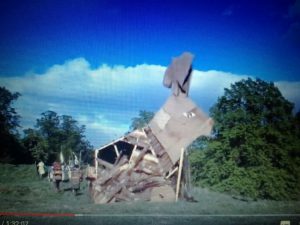 In the film, Sir Bedevere gets the idea of building a large wooden rabbit and then hiding inside it, facilitating their taking of the French castle. The problem with this being that the knights forget to climb inside the rabbit. Sir Bedevere’s only response is to build a wooden badger and try again, which would prove pointless, the element of surprise now being gone. The French take on the role as the Trojans as they are portrayed significantly different than Arthur and his knights, exemplified in their heavy accents and their use of strange insults. 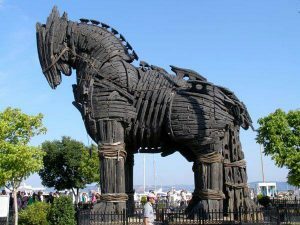 The contrast between the Greeks and the Trojans is shown through the analogy of the Britons and the French, where the Trojans as well as the French are described as the culturally different “others”. This analogy seems particularly well-chosen given that England and France previously have had a long and sometimes strained relationship – just like the Greeks and the Trojans. The wooden rabbit works as an interesting example of counterfactual history showing us the consequences for the Greeks had Odysseus’ plan not worked; the disclosure of the plan would have meant a devastating blow for the Greeks and further attempts of executing a similar plan would have been useless, leaving them outmaneuvered at the gates of Troy. As Odysseus lands on the island of Circe, she turns some of his men into pigs but changes them back at his request. During a witch-trial in MPHG we hear the tale of a man who, allegedly, was turned into a newt by the accursed witch. The man, clearly a man again, simply states that he “got better” as an explanation of his current human form. Arthur does not linger here because of a sensual marriage-seeking witch, but because he wants to solve the riddle put forth by Sir Bedevere, showing us the cunning side of Arthur so distinct for Odysseus. The role of the witch is adapted to the new context, and it becomes evident how this character has transformed from a lover and a helper in the Odyssey to a target for witch hunters in the Middle Ages. Whilst searching for the holy grail, Arthur and his knights find themselves in a cave with a many-eyed man-eating monster, that eats brother Maynard. This scene evokes Odysseus’ meeting with the cyclops, who also eats some of Odysseus’ men. The cyclops is called Polyphemus, and in ancient Greek the word “poly” can mean “many”, making this a perfect chance for Monty Python to twist the scene with the one-eyed monster of the Odyssey into something different and ironic. The Black Beast of Argh could also be a pythonesque version of the many-eyed monster Argos killed by Hermes in Greek mythology. Though the Black Beast in MPHG does not hold a nymph like Io captive, Monty Python might have found the inspiration for the Black Beast in more than one myth resulting in the fusion of beasts and myths pointed out here. Odysseus escapes by letting the cyclops believe his name is “nobody”. In MPHG Sir Robin escapes from a three-headed giant who wants to kill him after insistently claiming to be “nobody”, which gives us another hint of Monty Python’s clever use of the past. The Sirens from the Odyssey have become an iconic illustration of the femme fatale – an enticing yet dangerous woman who can only lead to the downfall of the hero. In the Odyssey the Sirens are mythical creatures singing so beautifully about the Trojan war that everyone must stop to listen to their song, but in MPHG the sirens are pictured as 160 young love-craving women thrilled to have Sir Galahad visiting their castle. As is customary in Greek epic due to the code of guest friendship, Sir Galahad is received with open arms – and dare I say legs. The young, half-naked residents or “sirens” of the castle are very explicit in explaining how far their understanding of the concept guest friendship goes. Sir Galahad (the pure) is eventually “rescued” by his fellow-knights, just like Odysseus only overcomes the challenge of the Sirens with the help of his shipmates. When Odysseus finally washes ashore at the Phaeacians, he is found and saved by the feminine princess Nausicaa, who is soon to be married. Alkinoos, the father of Nausikaa, mentions the possibility of Odysseus marrying Nausikaa more or less explicitly as desirable. When the masculine Sir Lancelot arrives at Swamp castle to rescue what he thinks is a damsel in distress, a wedding is under preparation as well. At Swamp castle we are presented with the androgynous prince Herbert/Alice, who against his will is about to be married. Herbert/Alice presumably plummets to the ground from the high tower and dies, prompting his father to adopt the bride – only to offer Lancelot her hand in marriage, in order to get his hands on the tracts of land surrounding Camelot. The themes are turned on their heads, and gender roles, the wedding, and love as such, as a result appear ridiculous. Both the wedding and love are cast aside in favor of personal ambitions; something that Odysseus also can be accused of in the Odyssey. At the same time this scene, and many other scenes featuring the knights, become a parody of ancient as well as Medieval heroic stereotypes – a consideration which might challenge or even change our perception of modern heroic ideals. As presented above, many comparisons can be made between the narrative of the Odyssey and MPHG. Furthermore, both can be described as comedy, although the ancient idea of comedy mainly covered the notion that the hero was successful in his quest and was able to return home, giving the story a happy ending. Therefore, the best way to label the genre of the film might be “mock-epic” – a genre that deliberately makes fun of the epic. In fact, the Monty Python webpage describes their following film Life of Brian as a “mock-biblical epic” making the above-mentioned assumption probable. Both works feature anthropomorphic gods, the main difference being that the polytheistic belief-system of Classical antiquity has been transformed to the context of a monotheistic Middle Ages. The heroes of the Odyssey as well as MPHG are guided by the gods, but the heroes of MPHG are significantly different than those of The Odyssey or other ancient epics, despite the use of epithets. The heroes of MPHG frequently flee while shouting “run away” when danger is afoot, the songs featured in the film are comic and presumably very different than those performed by the ancient rhapsodes, and just as Homer’s works are filled with sometimes very long excurses, so the film presents us with the ongoing discussion of whether or not it is possible for a swallow to carry a coconut. The moviegoers of the 50’s and the 60’s had been bombarded with films revolving around Classical antiquity – films that all glorified that age in some way. It is possible that this preference for Classical antiquity had an influence on the theme of MPHG – the achievement of the Pythons being a critical comment on the preferences of decades past. Via the time-clash presented in MPHG, the Python-group manages to play on the relationship between the Greek/Roman heroes and the Arthurian myth. The similarities between the adventures of Arthur and Odysseus binds the stories together but ridicules them at the same time. This could say something about what Monty Python thought of the myth indicating that the Britons might be descendants of ancient Greek/Roman heroes. The Pythons were innovative in their portrayal of persons and events, and for a good reason:” Historical figures dislocated from their original contexts […] are not simply referents for a punch line, but by being taken out of context, reimagined, and mashed up, history itself is made fresh and new.” This means that interesting things happen to the past when reused in a different context. The shared identity which is created through an existential use of history, here understood as the audience’s desire of identifying with the heroes of Classical antiquity, Monty Python turns in to an image of how the masses are blinded by myths, spin and charismatic leaders. This becomes relevant when seen in connection to when the film was released; 1975 – one year after England had faced an election, and a year where the rest of the world witnessed the war in Vietnam (1955-1975) while simultaneously being on the brink of a nuclear war (The Cold War 1945-1990). The intelligent way of dealing with history and changing it to fit a certain purpose, aims to inform the audience of the absurd structure of society and the equally absurd heroic ideal. The critique of modern political issues is expressed through the medieval peasant Dennis and his discussion of voting processes, the inequivalence in society and legitimation of power. Having a medieval peasant stand up to the authorities and express himself about topics relating to a different age and class, shows us how “the man on the floor” is equally entitled to his opinion as those higher up in society, and points to him, and the likes of him, as being just as smart and insightful as the leaders of society. The film also shows us how conflicts between different nationalities (in MPHG the Britons and the French) may easily escalate due to poor communication or misunderstandings – a possible comment on the tense atmosphere between The United Stated and The Soviet Union at the time. All this being said, the film works on several levels, and no matter one’s age, level of education or knowledge of both (king) Arthur and Odysseus, the film has something to offer. Personally, I can say that my current understanding of the film and its topics have changed immensely since I watched it for the first time as seven or eight years old almost thirty years ago. Ziolkowski, Jan M. 2007. ”Middle Ages” in A Companion to the Classical Tradition. Blackwell Publishing Ltd.